I guess since it was Gary Broadbent’s birthday on Saturday I thought I should do something boomerang related. Working with G10 is not that much fun and I have a real fondness for working in wood, even if it is plywood. I have been tracing some shapes on plywood, waiting for the chance to get them cut. No time like the present. I swapped out the carbide grit blade on the bandsaw (no more G10 to cut) for a blade more suitable for plywood and cut booms to my heart’s content. 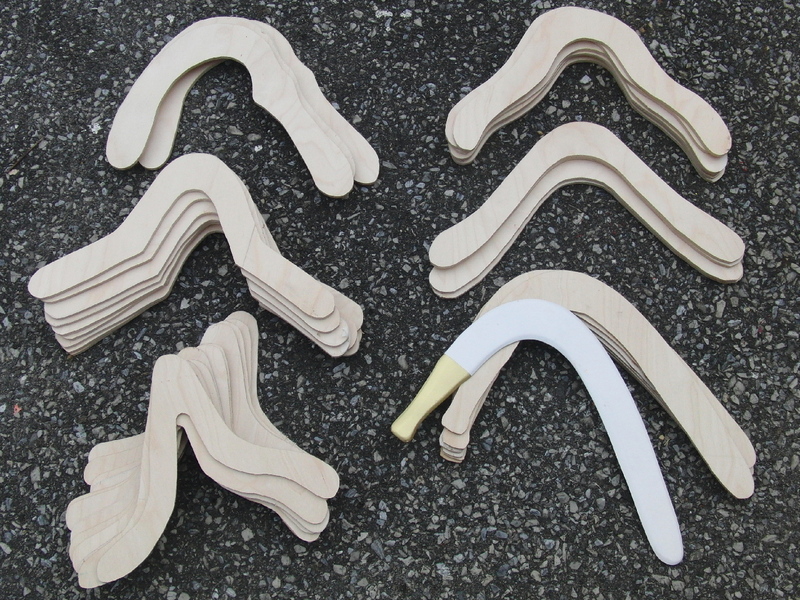 6 Fire Hose (4mm) shown with a finished boomerang so you understand. 41 booms in all, 1/4 inch unless noted. There were 10 more I didn’t cut. 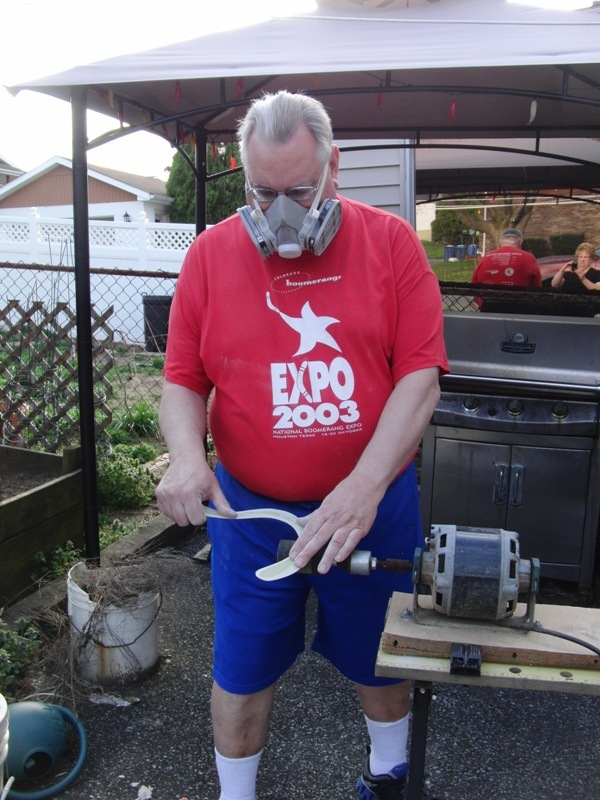 Those had a lot of inside or tighter curves and I would need to switch blades again on the saw. Looking at this photo all I can say is what was I thinking???? Sunday was a busy day at church so we got home late, then had to spend the afternoon cooking Chef Barb Monday Lunches. By 5 pm I was done cleaning up the kitchen, but was too tired to do any boomerang making. The shaping will need to wait for another day. 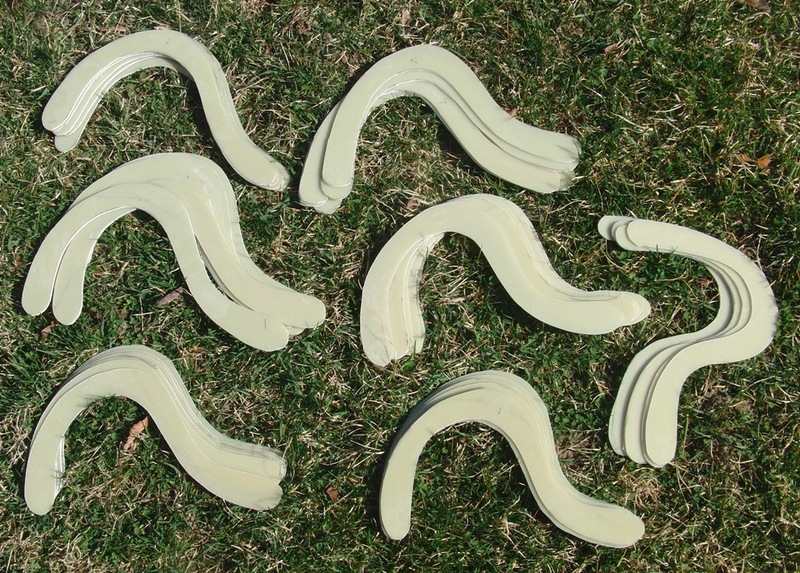 Still between the G10 blanks cut and the plywood ones, I have about 100 boomerang blanks to work on. I must be crazy. Well I finally broke through the barrier to shaping boomerangs last evening. I have been cutting long distance shapes from G10 sheet and stockpiling them. I now have 44 and that’s probably more than I can handle this year. Here’s a photo of them. Unless I started cutting our more boomerangs from plywood (my real plan) , I was going to need to start shaping some of this G10. I have a tendency to work for brief periods of time after work when the weather is nice. Getting home before 5pm and the temperatures in the 70’s certainly provided the opportunity. I grabbed a few blanks and started in. I managed to get 5 done, a couple each of full size and 90% size. This year I am trying a few different shapes in the reduced size to see how they perform. 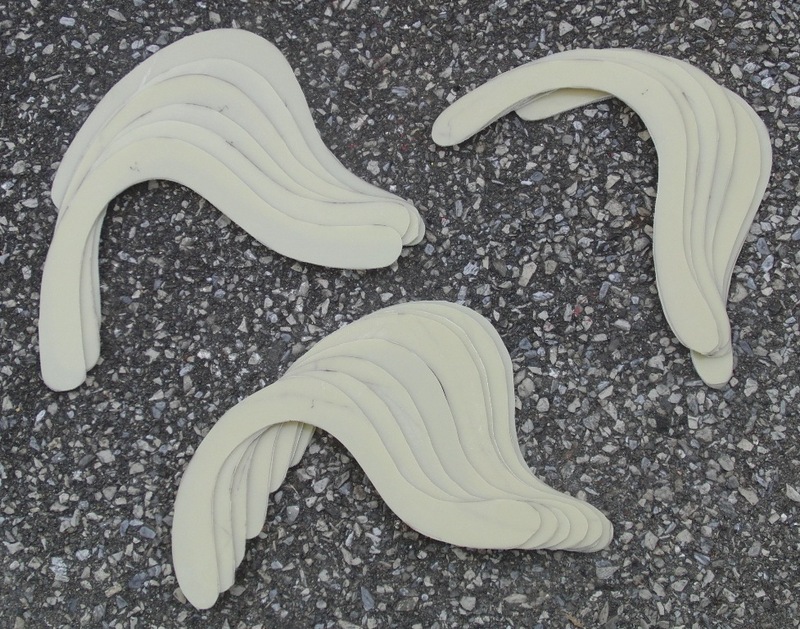 When I finished for the evening, the newly shaped boomerangs were tossed in my truck for the next testing session. That session came quickly. At lunch Thursday I just had to get out out the office for a bit. I headed to the field with the new boomerangs. Anyone need a recipe for disaster? Well, take some gray skies and add off white G10 long distance boomerangs. A friend did that, lost sight of a boomerang and took the return in the chest. 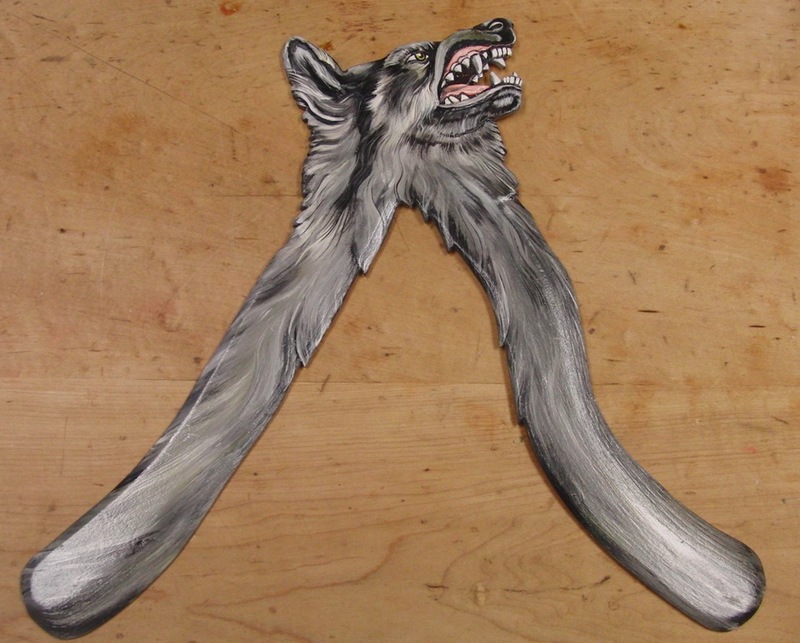 Long distance boomerangs are thin and sharp. He got pierced by it. I didn’t like the idea if being impaled. Well, there is good news and bad news. The bad news is the wind was barely a whisper. That’s the good news too. Most Long distance boomerangs need a good breeze to return well. Dead calm is terrible. However it did mean I wasn’t getting hit by anything. I got pretty decent flights from the small versions but my arm isn’t up to throwing the full size ones. I guess with a few test throws Sunday and these today, I still haven’t made 25 throws all year. I need to get more throwing in before really trying full size LDs. So there is the update from BoomerangDave. A little while back I posted photos of a few new artistic boomerangs I added to my collection. Well within the last two weeks I have purchased a few more and want to share photo of them. 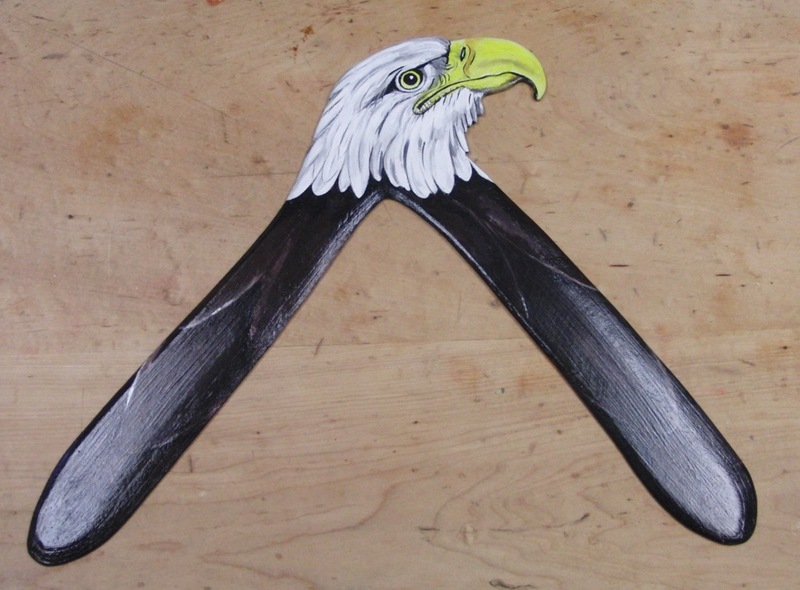 The fist one is an Bald Eagle boomerang by Siegfried Stiller. This is a left hand boomerang but since it is so beautiful, I don’t mind not being able to throw it. 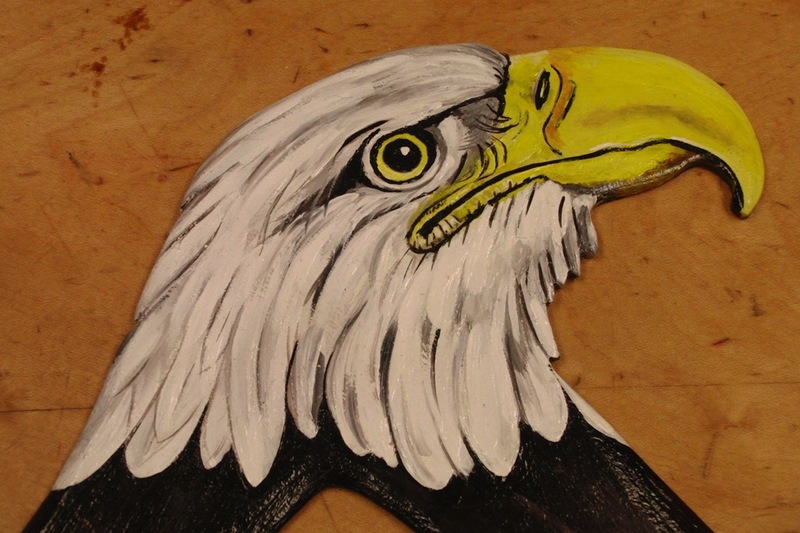 The painting of the eagle’s head is nicely detailed. Next we have another left hand boomerang by Stiller. This one is a wolf. 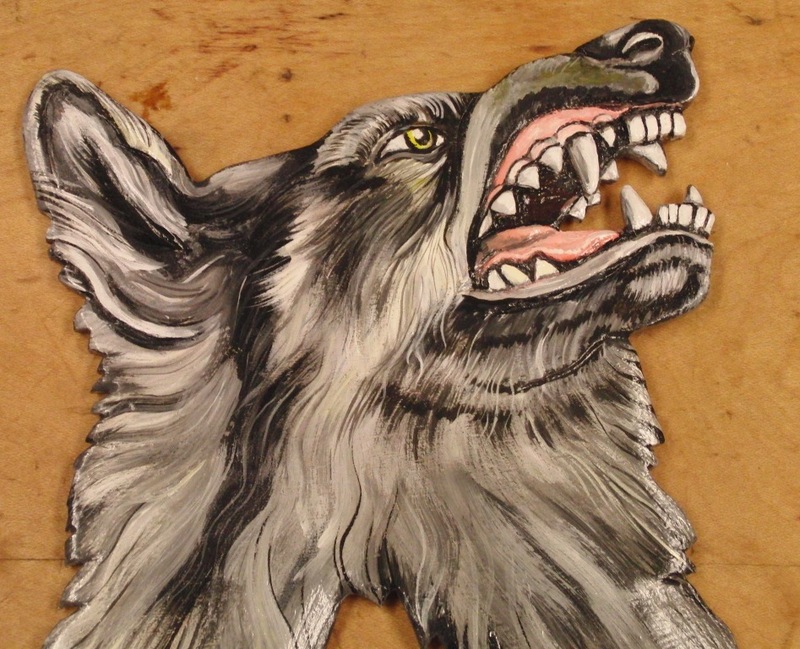 There is a lot of relief carving done in the mouth of the wolf around the teeth. There is also some carving at the ears. Of course the painting is superb as any othe Stiller boomerang I have seen. Well when the temperature crosses the 70 degree mark, there is no excuse for not getting something done in boomerang building. I had a little time after work Tuesday and decided to attack the piece of 3.3mm G10 I had waiting. 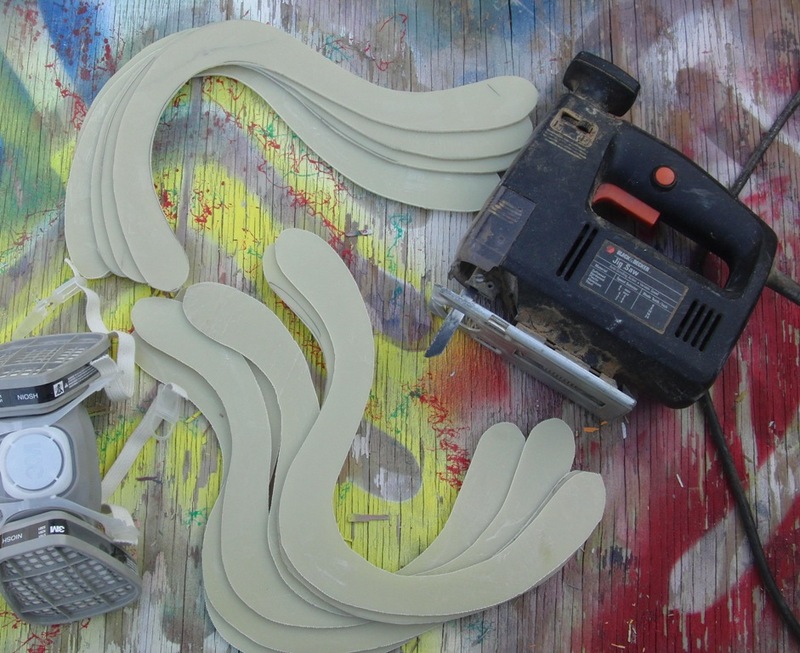 After cutting it apart to make the pieces more managable, I then hit the band saw to cut blanks apart. I ended up with 6 full size Voyagers and 5 full size Voyager 6 versions. I like the Voyager 6 and would use it more if my arm could handle it. I guess I’ll just have to be satisfied with the 90% size Voyagers instead. Hmmm, I haven’t tried a 90% size Voyager 6 yet. I wonder if it is woulth a try? Still have lots of 2.3mm G10 sitting around. With 31 G10 blanks already waiting shaping, i am not sure I should make more work for me. Photo from yesterdays session. Voyagers and Voyager 6 blanks along with saw (carbide grit blade) and dust mask (needed with G10 for sure). Looks like I was trying for an “artsy” photo. Monday the temps continued to climb. When I got home from work it was 68F and because of Daylight Savings Time, it was still light enough to do some boomerang work. Ove the weekend I had traced out some long diastance boomerang on aome 2.3mm G10 fibergass sheet, I also traced some on the thicker 3.3mm G10, to be used as full size boomerangs. As you can guess, my long distance boomerang customers will be happy soon. I still need to cut out the full size Voyagers and Voyager 6 styles but for now, it sure looks like I have my work “cut out” for me.